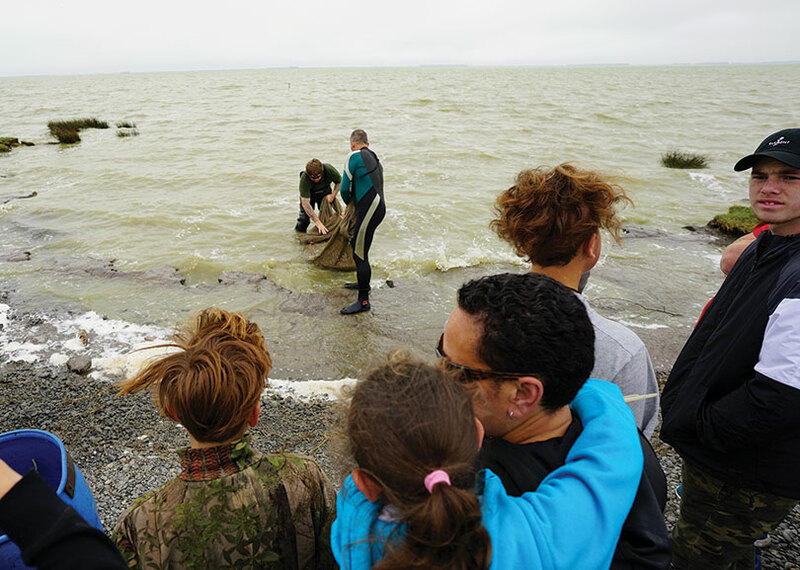 Practicing mahinga kai requires intimate knowledge of our seas and waterways – which makes participation difficult for most Ngāi Tahu living in urban centres. The difficulty is compounded by decreasing water quality and increased pressure on our fisheries, denying us and our tamariki the chance to participate in one of our earliest forms of cultural expression. Kaituhi SAMPSON KARST travels to Ōnuku to observe a mahinga kai wānanga run by Pere Tainui, a man determined to keep kaimoana on the menu. The distinctive silhouette of Karaweko is the first thing that visitors to Ōnuku Marae see as they drive towards the seaside pā. The whare tipuna has been a point of pride for the small community since it was built 21 years ago. The second building that comes into view has been a feature of the bay for much longer – the whare karakia, perched on the hillside with views stretching right across the harbour. It was opened in 1878, making it a place of pilgrimage for Akaroa and Banks Peninsula residents for more than a century. Down on the shore there is a third building – if you could call it that. 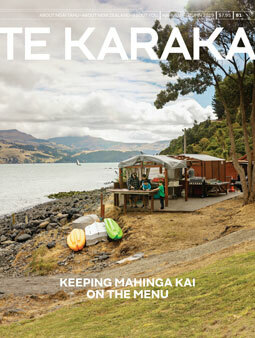 Despite its humble appearance, the whata kai is as integral a part of the marae as the wharenui and the whare karakia. It’s a place where the community can gather and partake in a rather different type of doctrine. 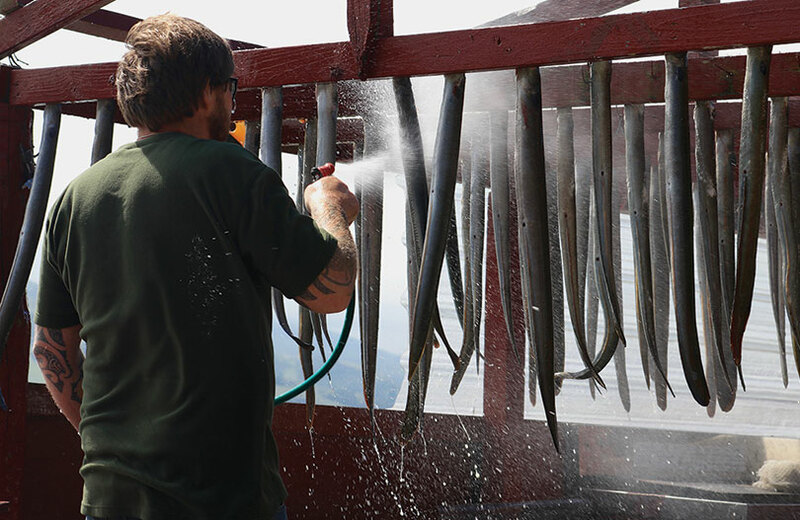 The whata kai is like an open air kitchen where fish can be processed, dried, and smoked. The fishing nets on the exterior wall are the first sign to the uninitiated that this is a place where kaimoana is processed. Others will see the hooks that line the wooden girders overhead, and realise that the contemporary structure is implementing ancient methods of customary practice. The whata kai is like a second home for Pere Tainui (Ngāi Tārewa, Ngāti Irakehu), who has been running a series of wānanga to teach local tamariki about mahinga kai, an idea that developed after a whānau hui at Ōnuku. Pere popped into the marae kitchen and asked his sister to help him create home-made fish and chips, but some of the kids still weren’t keen. He ducked back into the kitchen and emerged with another tray, announcing that he had also prepared chicken. The trick confirmed his suspicion – with a bit of encouragement (and a small white lie), the kids were indeed seafood fans. This exercise gave him the affirmation he needed to run a series of wānanga, and with funding support from Te Pūtahitanga o Te Waipounamu, his vision was soon to become a reality. “I was raised on mahinga kai – it was passed down to me from my uncles and my father. I’ve taught my older boys, but it was time for me to teach the rest of our tamariki,” Pere says. Helen Leahy, pouārahi of Te Pūtahitanga o Te Waipounamu, reveals that this quietly spoken man of humility was exactly the right person to lead the mahinga kai project. Above: Pere Tainui, mahinga kai programme co-ordinator. “Whether it’s working on the Rāpaki Bridge project or dropping a flounder in to a family in need, Pere has always understood the importance of engaging with the whole whānau, including not only kaumātua, but the mokopuna as well. 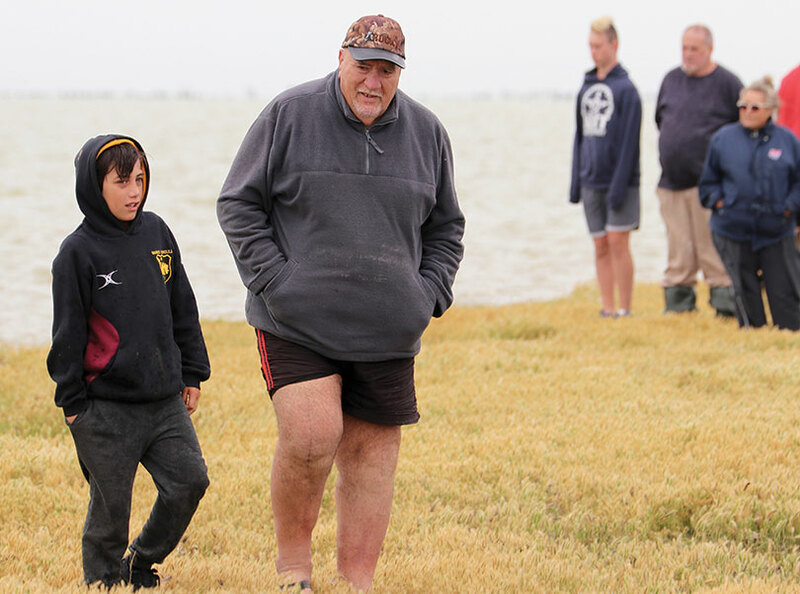 As well as passing on traditional knowledge to the younger generation of Ōnuku whānau, Pere also wanted to put an emphasis on learning how to fish safely. 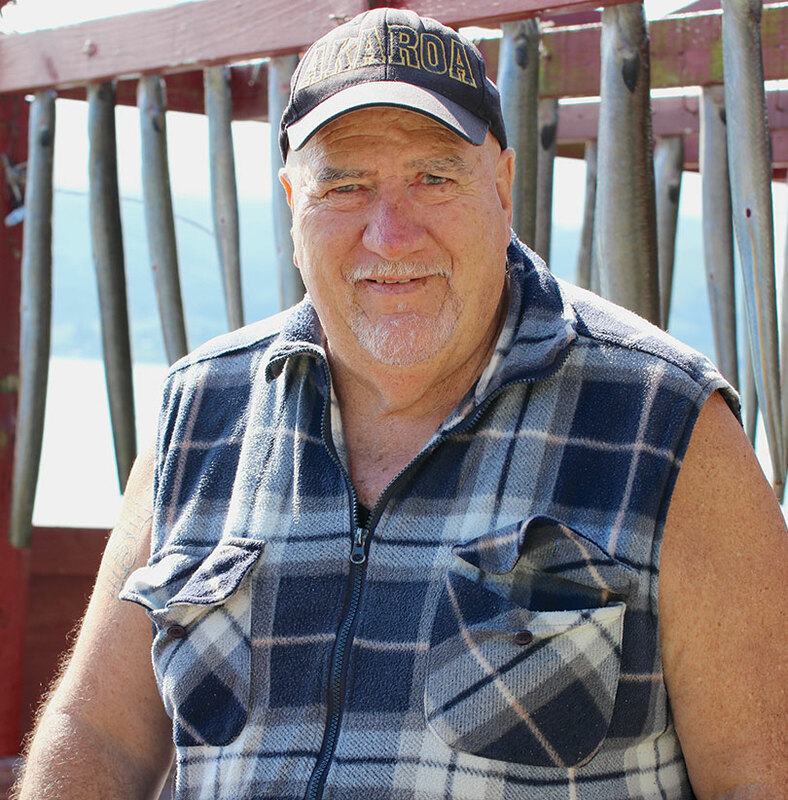 As a fisherman for 15 years, he knows full well that some of the boats at Akaroa were once crewed by men who didn’t even know how to swim. He hopes that educating tamariki in safe marine practices now will ensure that they keep it front of mind as they grow up. Another key element of the wānanga series is about taking the tamariki back onto nohoanga sites and places of cultural significance. At their second wānanga, the rōpū started the day at Te Koroha, a nohoanga site on the shores of Te Waihora. During his kōrero, the tamariki learned that the site has been occupied by their tīpuna stretching back for many generations. Pere spoke about the abundant resources in and around the lake, and explained the seasons our ancestors would collect birds and the main fish species. Some of the adults waded out to collect the nets that had been set overnight, giving the children a chance to run along the shore and explore the ecosystem. Many of the girls busied themselves by searching for the best bird feathers in the grass and tussocks, while the boys made a beeline for the nearest pools, daring each other to jump across. At first glance the lake shore seems barren, a monotone beige of sun-baked grass. The echo of laughter transformed the environment. The tamariki took the time to flip rocks and appreciate the small creatures beneath. They marvelled at the spectrum of colour that can be found on paradise duck feathers – all before they even had a chance to see what they had landed in the fishing nets. 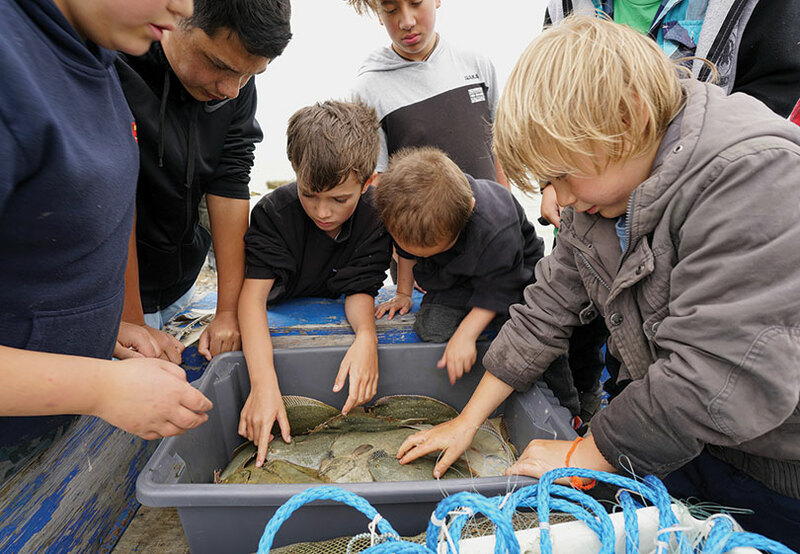 When the nets returned, one wānanga participant was eagerly waiting to see how many flounder had been caught. Melina Allan-Griffiths had spent hours perfecting the art of net-making during the first wānanga. She was pleased to learn that her 50-metre net hauled in 53 pātiki. After lunch the group packed up and travelled back to the whata at Ōnuku. Pere has been processing fish for decades, and it shows when he joins the production line. Knowing where to make the cuts and how to remove the bones can look easy, but, as he explains, it can be dangerous work. His approach to mitigate the risk was simple: let the children observe, and teach the parents. Pere understands that educating all whānau members – not just the tamariki – about mahinga kai will help ensure that the practice stays alive and relevant. He has big aspirations for the kaupapa, but for the meantime, he simply wants to endear the natural environment to the tamariki. The wānanga series may change and develop as the tamariki express interest in different domains of mahinga kai. One potential avenue Pere has identified is commercial fishing. Pere remembers a time when his grandfather used to trade his groper catch for tuna with his whanaunga from Taumutu. The practice of kai hau kai may seem like a simple exchange of food on the surface, but it was once central to the Ngāi Tahu way of life. The exchange was a type of diplomacy that would reinforce kinship, assist with correspondence, and drive commerce. Pere’s deep understanding of these customs make him a patient and attentive educator – the perfect person for the job of revitalising mahinga kai practices and passing on a body of knowledge that cuts to the heart of who we are as Ngāi Tahu. The tamariki who are lucky enough to participate in Pere’s wānanga can explore our oceans and lakes in a safe and interactive way that will ensure they always associate mahinga kai with whānau, fun, and laughter. The mahinga kai programme was funded by Te Pūtahitanga o Te Waipounamu and is designed to reconnect tamariki, rangatahi and whānau with ngā taonga o te taiao. A series of weekend wānanga have been held over the past few months for rangatahi who whakapapa to Ōnuku and the surrounding Horomaka rūnanga. Pere is hoping to run a second programme later this year if funding is secured.